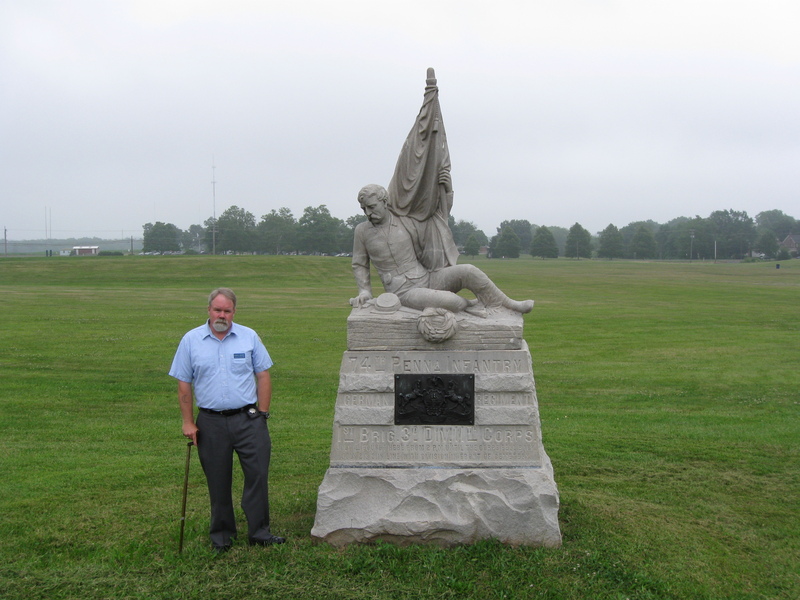 Gettysburg Licensed Battlefield Guide Stuart Dempsey is the host for our series on the Eleventh Corps at Gettysburg. He is standing in the fields north of Gettysburg near West Howard Avenue. Oak Ridge is in the left background. Oak Hill is in the center background above Stuart. This view was taken facing northwest at approximately 9:45 AM on Wednesday, July 22, 2009. In today’s post, Stuart gave some background about the men who made up the Eleventh Corps, and their desire to perform well after the Battle of Chancellorsville in May, 1863. This map shows the location of where our Eleventh Corps at Gettysburg videos were produced. Videos #1-#7 were shown on other maps on our previous posts. Videos #8 and #9 were taken on East Cemetery Hill. Video #10 was taken near the intersection of Baltimore Street and Middle Street. Videos #11-#13 were taken on the roof of the Fahnestock Building. Videos #14 and #15 were taken near the Taneytown Road entrance to the Gettysburg National Cemetery. Videos #16 and #17 were taken on West Howard Avenue near its intersection with the Mummasburg Road. 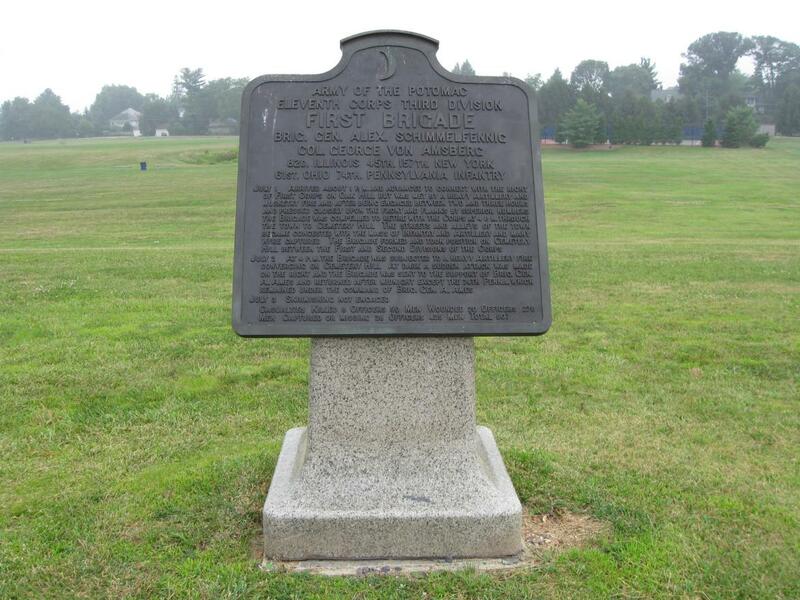 Videos #18 through #20 were taken near the marker for the Third Division of the Eleventh Corps on West Howard Avenue. This map was created facing north at approximately 3:00 PM on Friday, July 31, 2009. In Video #17(Videos #1- #16 were shown in our previous Eleventh Corps posts) Gettysburg Licensed Battlefield Guide Stuart Dempsey presents the time that he thinks that the lead elements of the Eleventh Corps arrived at Gettysburg on July 1, 1863. The view was taken facing northwest at approximately 9:30 AM on Wednesday, July 22, 2009. 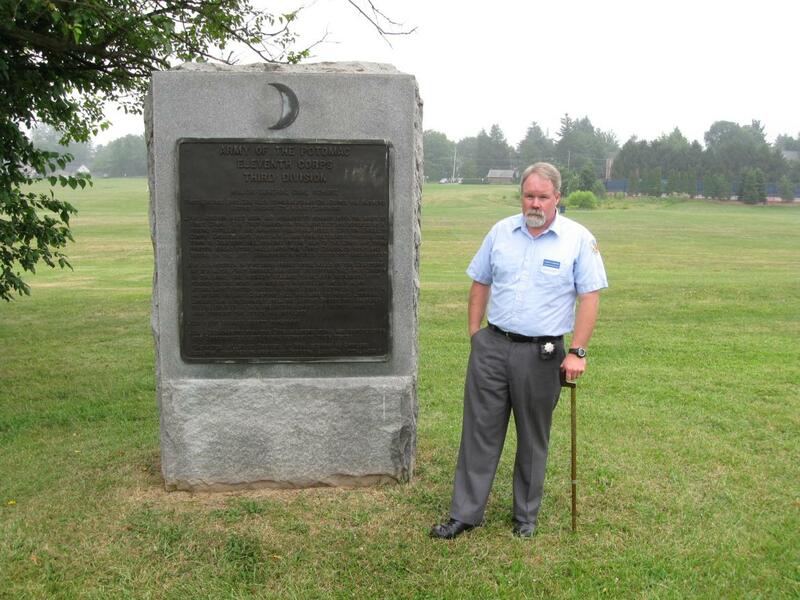 Licensed Battlefield Guide Stuart Dempsey is standing in the fields north of Gettysburg near West Howard Avenue. The monument to the 74th Pennsylvania Infantry Regiment is in the left background. The marker for the Third Division of the Eleventh Corps is to the left of the small tree. The monument to the 45th New York Infantry Regiment is between Stuart and the tree. This view was taken facing northeast at approximately 9:45 AM on Wednesday, July 22, 2009. 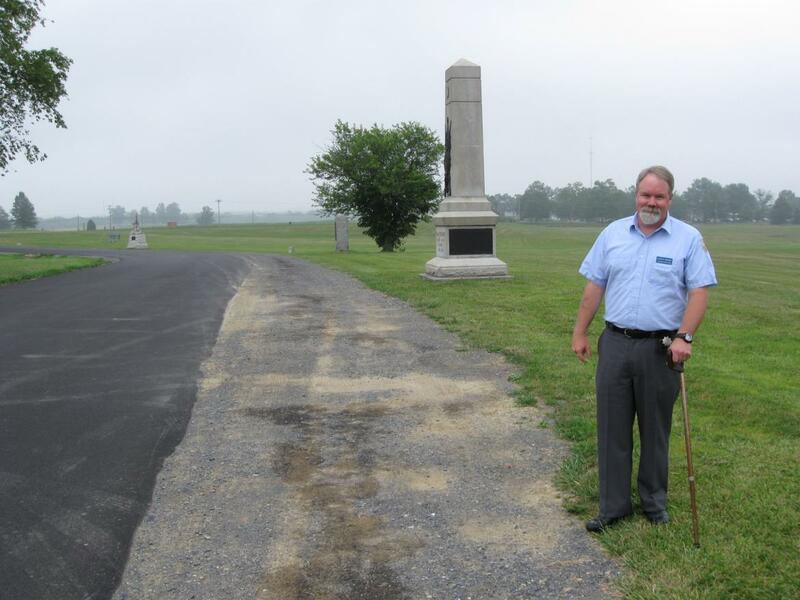 In Video #18 Licensed Battlefield Guide Stuart Dempsey describes some of the challenges experienced by the Third Division of the Eleventh Corps as it marched to Gettysburg. The view was taken facing northeast at approximately 9:45 AM on Wednesday, July 22, 2009. 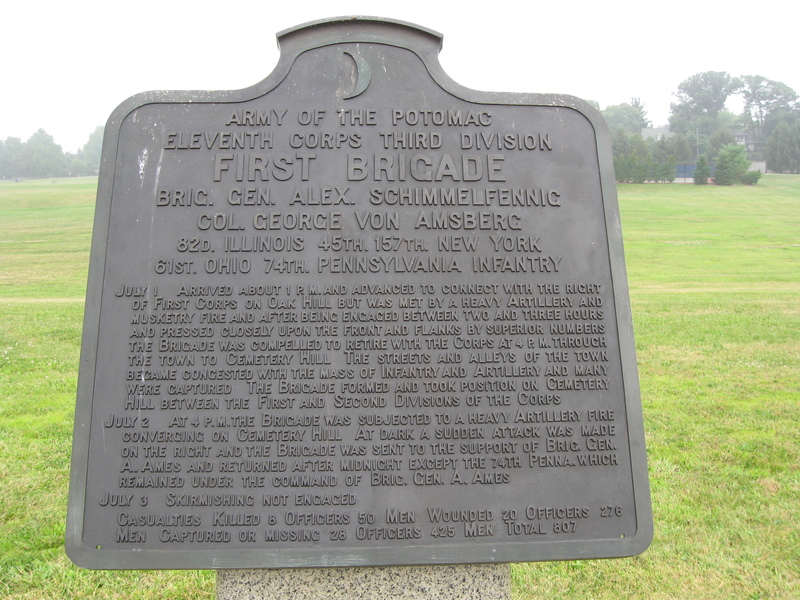 The first brigade of the Eleventh Corps to reach the fields north of Gettysburg was Alexander Schimmelfennig’s First Brigade of the Third Division. This view was taken facing southeast at approximately 9:45 AM on Wednesday, July 22, 2009. A closer view of the plaque of Schimmelfennig’s Brigade. This view was taken facing southeast at approximately 9:45 AM on Wednesday, July 22, 2009. A regiment that proudly displayed its German heritage on its Gettysburg monument was the 74th Pennsylvania Infantry Regiment. This view was taken facing southeast at approximately 9:45 AM on Wednesday, July 22, 2009. Stuart Dempsey is standing by the marker to Carl Schurz’s Third Division of the Eleventh Corps. This view was taken facing southeast at approximately 9:45 AM on Wednesday, July 22, 2009. In Video #19 Stuart Dempsey is standing by the War Department marker to the Third Division of the Eleventh Corps on West Howard Avenue. Stuart describes some of the reputation and perceptions versus the reality of the men and units in the Eleventh Corps. The view was taken facing southeast at approximately 9:45 AM on Wednesday, July 22, 2009. 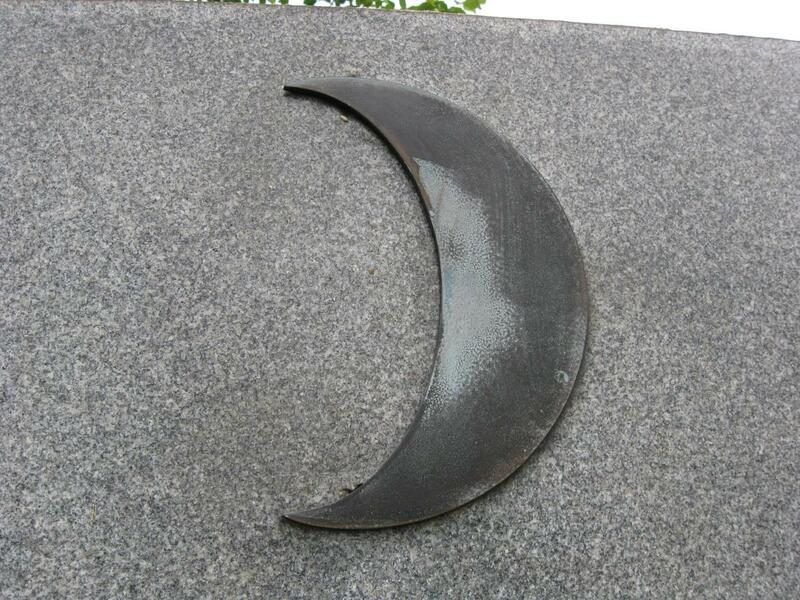 The corps symbol of the Eleventh Corps was the crescent moon. This view was taken facing southeast at approximately 9:45 AM on Wednesday, July 22, 2009. In Video #20 Stuart Dempsey is standing by the War Department marker to the Third Division of the Eleventh Corps on West Howard Avenue. Stuart describes that after their loss at Chancellorsville in May, 1863 some members of the corps hoped to achieve some redemption in their next battle. The view was taken facing southeast at approximately 9:45 AM on Wednesday, July 22, 2009.